When my friend told me she was having a little girl I knew I needed to come up with some easy girl baby shower ideas. My house is full of cars, trains, dinosaurs, firemen, around my house it is all boy, as far as the eye can see. Not a trace of anything girl. I love it all but there’s something about little girls that is irresistible! So when one of my best friends found out she was having a girl I can’t tell you how excited I was. Off to my computer to look up ideas for anything and everything girl. Looking up baby shower ideas I saw the theme “She’s Just About to POP!” and that was it. I had to do it. I did it with a little bit of a girl spin, taking my inspiration from a piece of scrapbook paper. 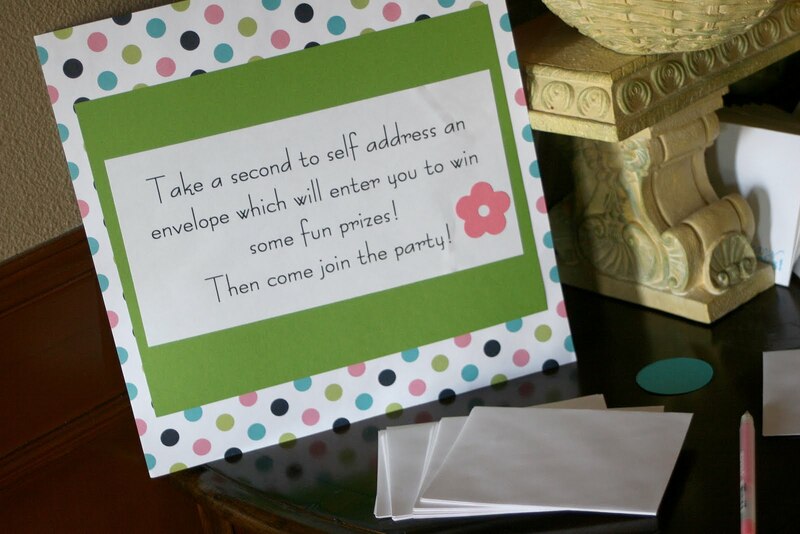 When people entered we had them write a self-address envelope for mommy to send thank yous. You can use any sort of thank you card that fits the theme. This will make things really easy for mom to write those thank yous. Who has time to address all those? Super easy to make pom poms. Thank you Martha who has a tutorial! Or if you don’t have time to DIY it, you can always buy some here in ALL sorts of colors! I loved having a variety of colors and sizes. This easy banner was handmade by me using some scrapbook paper and while I was going to use one of my FAVORITE tools ever (my silhouette machine) I ran out of time and just drew it. My handwriting is terrible but it does the job. 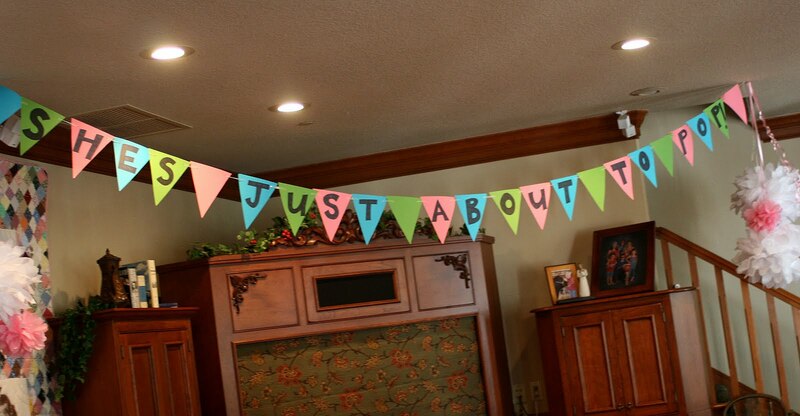 Again, if you don’t want to do a DIY baby shower banner you can always buy some CUTE ones here. 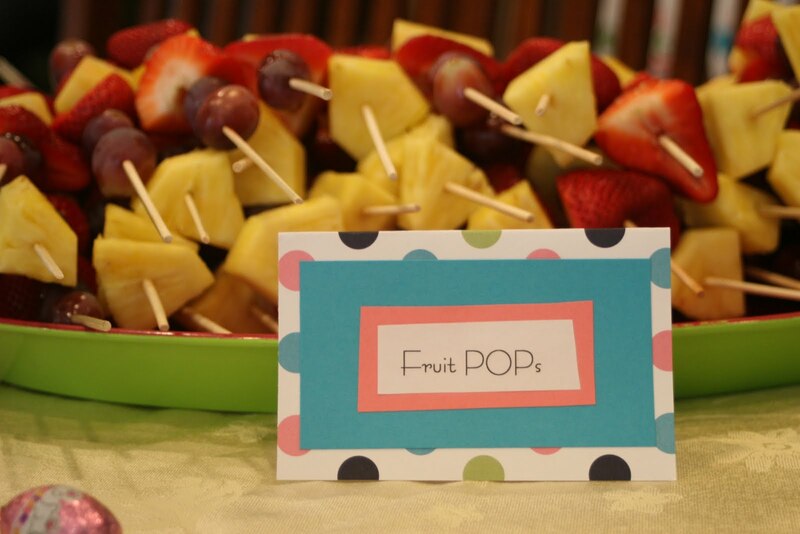 All the food was labeled with emphasis on the word “POP” like otter POPs, soda POP, Jalepeno POPers, POPpy seed muffins, POP corn…..
Also not pictured, I had a ton of different sized dots in the colors spread out on the table, entrance… it was an extremely simple (and cheap) way to decorate. 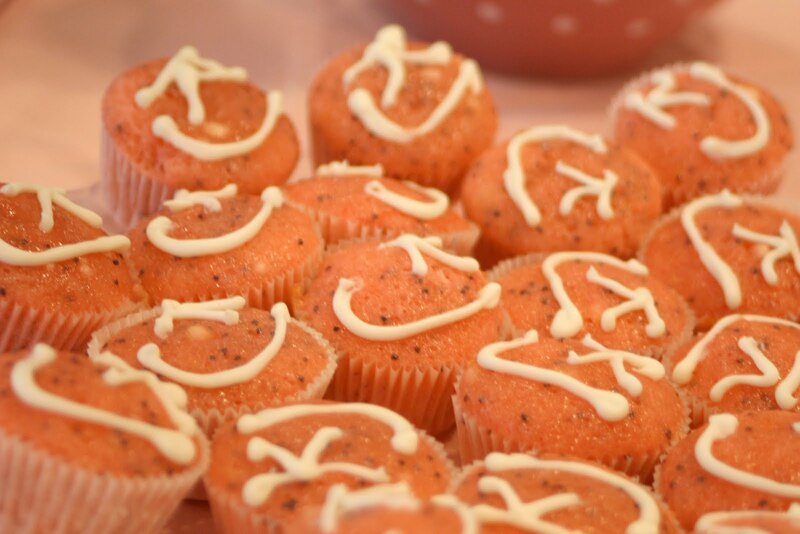 I made poppy seed muffins and while I was making them I happened to have my food dyes out and decided to make them…PINK! Also frosted baby to be’s initials. Super easy with a little help of my favorite piping tips. 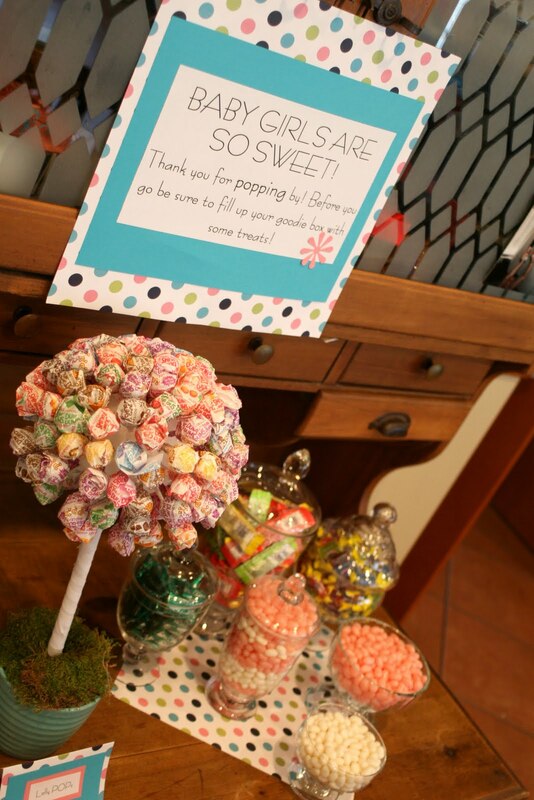 As thank you gifts we had a candy bar with a lollypop tree I made. That everyone put in these take out boxes! The shower was a lot of work, but totally worth it. Mama was so happy! I hope you find some of these easy girl baby shower ideas helpful in planning your next shower! You did awesome! I just love what you did. 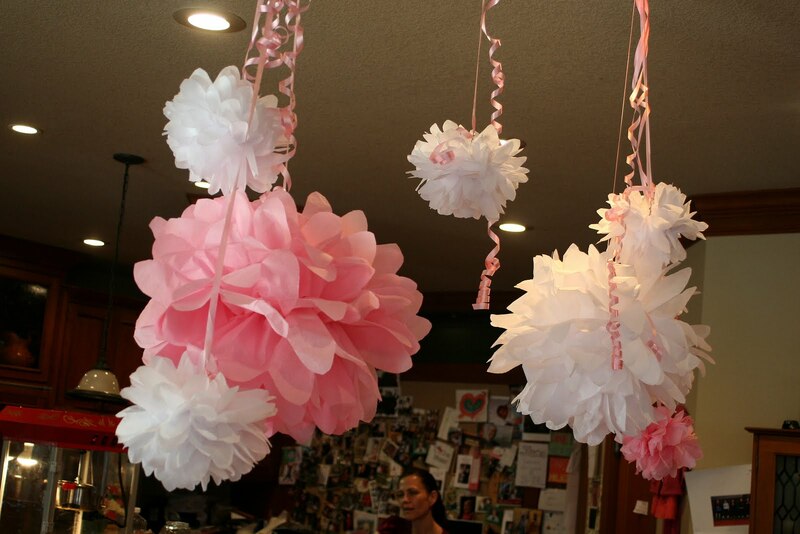 I need to post the pom poms I made for the kids toy room up on my blog. Great job! Great take on the theme! I love the lollipop topiary! I'm fetauring this! Stop by and grab a featured button if you want 🙂 Thanks for joining Idea Sharin' Wednesday! SO So cute! I love all of it! Thanks for sharing at 'Look at me, I'm SO Crafty!' at Fun to Craft. oh i love this theme!!! bookmarking this one to feature down the road.. i'll link you up! love it! Thank you Thank you Kendra!! I love being the benefactor of your amazing talents!! You rock my friend!